CHICAGO – The number of hospitalized infants, children and teens who experienced adverse reactions to opioid painkillers increased by more than half between 2003 and 2012, according to research being presented during the American Academy of Pediatrics 2017 National Conference. The study abstract, "Adverse Effects from Opioid Use in Hospitalized Children in the United States: a 9-year trend from 2003 to 2012," will be presented on Friday, Sept. 15. Researchers examined 2003, 2006, 2009 and 2012 data from the Agency for Healthcare Research and Quality's Healthcare Cost and Utilization Project Kids' Inpatient Database (KID) to analyze hospital stays of children aged 1 month to 17 years. "We found opioid-related problems were relatively common in hospitalized children," said abstract author Jessica Barreto, MD. 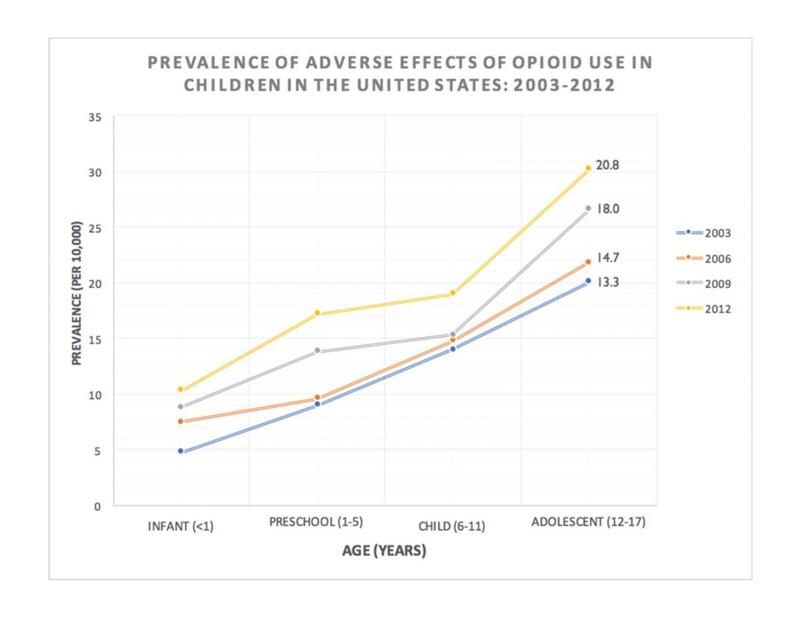 Overall, opioid-related problems were documented in 16.6 children per 10,000 discharges. The prevalence significantly increased over the years from 13.3 per 10,000 discharges in 2003, she said, to 20.8 per 10,000 discharges in 2012. The most significant finding was that the frequency of opioid withdrawal has more than doubled since 2003, said Barreto, a third-year pediatrics resident at Nicklaus Children's Hospital in Miami. Adverse effects from opioids were highest in white children in every year examined, suggesting race may play a role in which children are prescribed opioids to treat pain. In addition to opioid withdrawal, which affected 3.1 percent of the hospitalized children, other adverse effects included constipation (12.5 percent), altered mental status (10.5 percent), opioid withdrawal (3.1 percent), urinary retention (2.3 percent), cardiac arrest (1 percent) and anaphylaxis (0.75 percent). "For the past two decades, doctors have been increasingly recognizing and treating pain in children. Unfortunately, the efforts to improve pain management in children have led to a significant rise in the use of opioids both within hospitals as well as in the outpatient setting," Barreto said. "While these medications are valuable in providing pain relief, there are various developmental factors that place children at higher risk of toxicity," she said, "Further studies on the safety and efficacy of opioid use in children and alternate pain medications with less toxicity and addiction potential are urgently needed," she said. "In the meantime, judicious use of opioid medications for the treatment of pain and monitoring for their side effects is crucial." Dr. Barreto will present the abstract on Friday, Sept. 15, between 4:30 p.m. and 5:45 p.m. at Ann & Robert H. Lurie Children's Hospital of Chicago, Northwestern Pritzker School of Law's Thorne Auditorium, 375 East Chicago Ave.